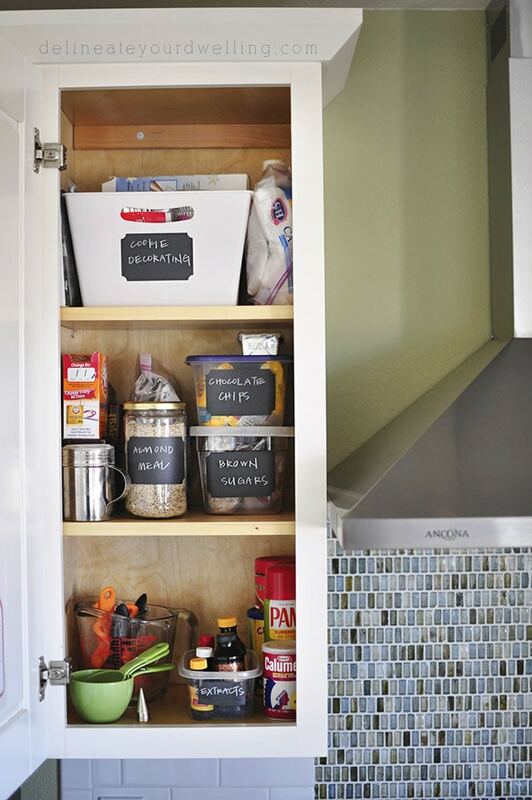 INSIDE : How to organize and arrange your Kitchen Cabinets and drawers in 15 minutes. Purge the old unneeded items and with a few important kitchen cabinet organizing ideas, get ready for all that extra space! 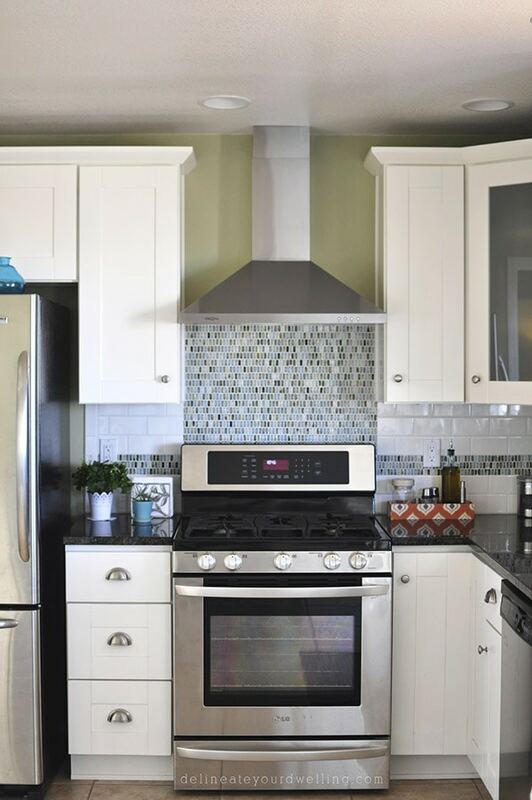 Last year I shared four posts on how we were able to create a high end looking kitchen for a low end price (Post 1, Post 2, Post 3, Post 4). The thing I didn’t share was what sat behind those lovely white cabinets… let me fill you in, it was a LOT of craziness. Our kitchen remodel has been done for five years now and I am FINALLY getting around to making sense of the cabinet contents. 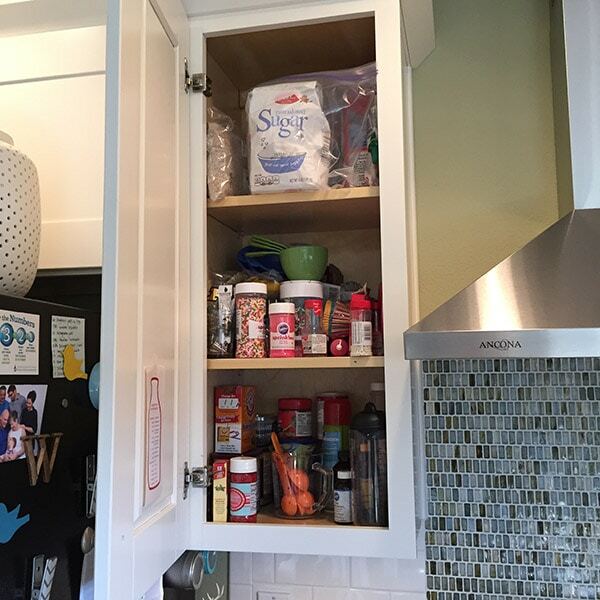 Today, I am proud to share How to organize and arrange your Kitchen Cabinets and drawers in 15 minutes! I took a quick cell phone picture before I started my cabinet organizing so you could see what I was working with. This top kitchen cabinet holds baking items of all sorts. Nothing except what was directly in the front was easy for me to get to or see. The top shelf had larger packaged extras (sugars, flour, etc) and when I was done using one of them, no joke at all – I would just package it back in it’s ziplock and throw it up there. I’m only 5’3″ so there is no way I can reach up there easily. My husband would laugh / shake his head each time I started throwing the flour and missing a few times. The middle shelf held lots of cookie decorating items, sprinkles, cupcake liners, sugar cookie cutters, etc. The bottom shelf held more baking ingredients, measuring spoons, my salad dressing mixer, etc. Here is what my cabinet looks like after spending just a few minutes really thinking about my needs, being intentional and putting them away by priority. Hello, why did I live with kitchen cabinet chaos for FIVE YEARS when I could have had this? Also, notice how much room there actually is in this kitchen cabinet when things are just organized as they should be! 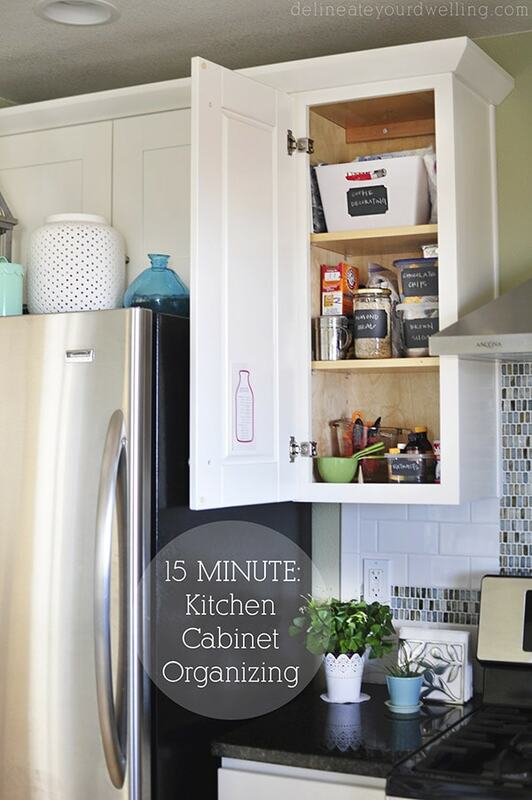 Ready for my 15 minute kitchen cabinet organizing ideas? 1. 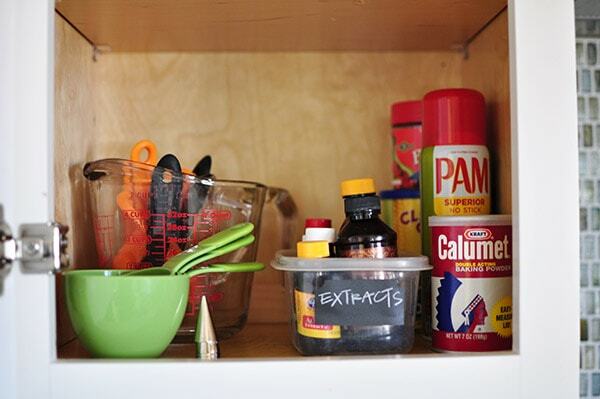 Take 5 minutes to remove ALL the items from a single kitchen cabinet. 2. Take 3 minutes to purge all the expired items! Did you know butterscotch chips expire? Well mine did in 2012 YIKES – so out they went. It was shocking how many items I threw out, simply due to being old. 3. Take 1 minute to evaluate what you have left and what you use the most. This is your new plan of action. 4. Take 6 minutes to put your remaining items in CONTAINERS and back onto the appropriate shelf per your step #3 decisions. 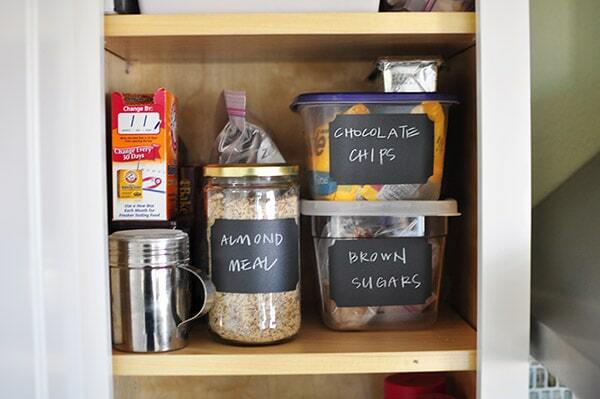 If you have 5 extra minutes, label your containers for extra ease. I already had a set of these lovely Chalkboard Labels on hand. Little pro tip, for a “chalkboard look” but no worry of your labels wiping off, I always use a white colored pencil! During step #3 of my 15 minute organizing, I realized I had items all on the wrong shelves! I had items I RARELY used taking up valuable middle shelf space. 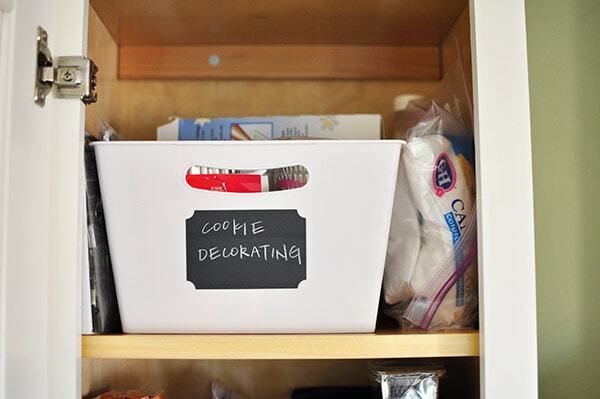 So the first thing I did was contain all the cookie decorating items and place them on the top shelf. Although I do a lot of baking, I rarely need sprinkles or fancy frosting tips on a regular basis. I just used a simple plastic bin to contain all of those items, similar to these. My middle shelf now contains items that we use on a mild to fairly common basis. It’s surprising how much we go through chocolate chips (Our Saturday mornings often start with the husband making chocolate chip pancakes.). 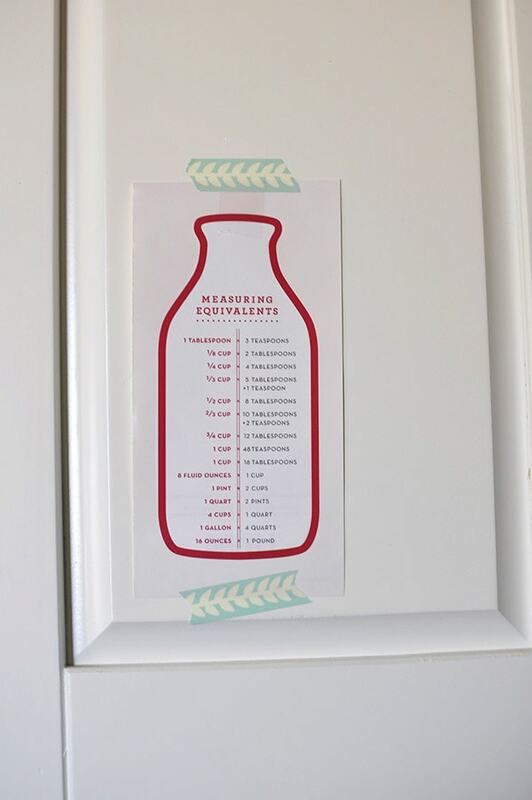 For many of these items, I simply used plastic containers or glass jars and added labels to them. And the bottom shelf now contains items I use every single day, measuring cups and spoons, non-stick spray, etc. The other side of the stove has an exactly mirrored cabinet and he was equally as chaotic. I contained all my sauces + mixes and our plethora of herbs and spices on that side. I bought a set of two of these Kitchen Cabinet Organizers from Amazon, Copco 3-Tier Cabinet Organizers. It’s amazing how many spices these guys actually can hold. They come in 10″ and 15″ widths. We have the 10″ size. Much to my husband’s annoyance, I have my herbs alphabetically organized. I find it most helpful for me to always know where the herbs are by being able to go to the correct spot every single time for the curry or oregano. Now that these two cabinets are organized, it’s amazing how often I find myself just opening them, taking a peek and sighing with happiness. Now, it’s time to tackle the two or three other “catch all” cabinets! 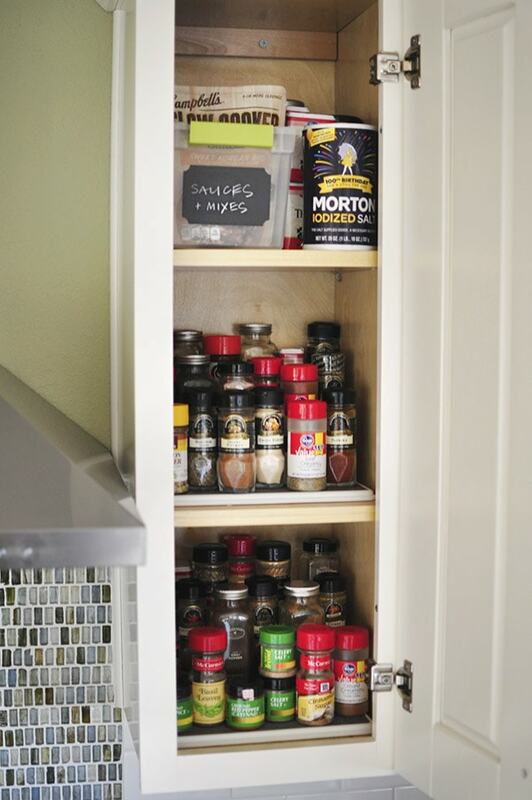 Have you tackled tidying up your kitchen cabinets? Any tips or organizing secrets you’ve found to help keep things tidy? 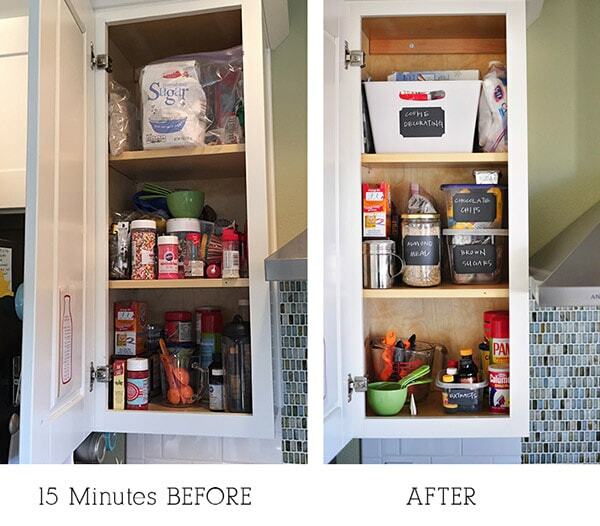 I’d love to hear if you try my 15 Minute Kitchen Cabinet Organizing System — be sure to share in the comments below! Thanks for inspiring me! What I loved about what you did with your cabinets was that it was very practical. I am not an OCD organizer, but needed to take back control and do something to get things back in order. 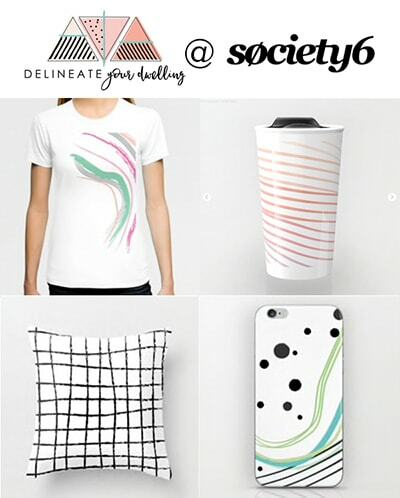 Your ideas and pictures helped immensely! I felt so much better after just doing one cabinet and am now inspired to keep going. Yay, Lisa! It’s so hard to just start but once you do it gets easier and easier!! I serious love chalkboard labels. 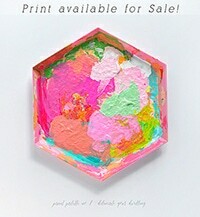 My entire craft/printing station is full of them and I’m thinking that I need to bring them to the kitchen too! Thanks for sharing! Chalkboard labels are just the best! Thanks for stopping by Kate. Isn’t it amazing that the things we neglect take so little time! Great tips Amy! Thanks for sharing at Fridays Unfolded!! We love having you each week 🙂 Pinned! Usually I get as far as the “remove everything” step then the phone rings or someone needs something and I come back an hour later thinking “ops” and sling it all back in! We are moving house though so I have chance for a fresh start. I will try to start as I mean to go on so these tips will be handy. Confession – when packing I found gravy browning(which may be a UK thing I’m not sure if you have it) which expired in 2005 – ops! I hear you, Julie! There are always pulls to distract… sigh. But, even if it takes a bit of time, it’s so worth it in the end! And I always find SUPER old things hiding in there, so you’re not alone – ha! My cabinets definitely need attention! Thanks, Carmen! I’ve only done two of them… so I’ve still got a long way to go, ha! My kitchen desperately needs this! My kids just throw stuff in any ol’ cabinet just to make it look like their chores are done. I need to reorganize the kitchen as a whole. I’m struggling with how to decide what items should go in what cabinets? Any suggestions or tips to help the lay out of the kitchen to flow? I have plenty of kitchen cabinet space but my small appliances take up allot of it. Just can’t decide what cabinet should be dedicated to which items. Leslie, thank you for asking this question! I think it’s a common issue… we ALL just put stuff wherever and sometimes it makes sense and sometimes it doesn’t. Maybe I should do a post about basic cabinet layouts? Would that be helpful? Ha! I’m glad I’m not the only one who has items that expired in 2012! Tee-hee. I just did my spice cabinet. That one was the worst. Thank you for sharing on Found & Foraged. It looks great and love the fact you chose chalkboard labels. It takes me forever to get that drawer to declutter and organise! Hey, stopping by from the Party Bunch Link Party! Our cabinets looked like your before picture too and I finally just got around to organizing them and now they look so pretty I just want to leave them open. Well it only took me FIVE years to do two of our cabinets so at this rate I’ll be done and ready to head to your kitchen by 2025! HA. Great ideas. I love the chalkboard labels. You did a lovely job! I do this once a year but it always eventually gets out of sorts! It is time to do it again! I do pretty much the same you did here but without containers. This time I think I will use them! Oh my, you are so smart to do this once a year!! As soon as I get all the cabinets under control, I may have to start a yearly clean out. And yes, containers make it so much easier! These are great tips! I need to do this. I really couldn’t believe how quick it went once I put my mind to actually just DOING it!